Last week, we told you that because of the collapsing ruble, Apple had halted online sales in Russia. The reason behind this decision harkens back to Economics 101. A sharply lower ruble means that when Apple converts the currency back to dollars, it receives a sharply lower amount than it previously received. And with the ruble in freefall, Apple would have to adjust its prices continuously in order to keep its profit margins in line. Instead, the suits in Cupertino decided that it was easier just to temporarily halt sales in the country. Today, Apple re-opened its online store in Russia after raising the price of the 16GB Apple iPhone 6 by 35%. The phone now is priced at 53,990 rubles ($956 USD). Last week, the handset was priced at 39,990 rubles. Raising interest rates is one way to support a falling currency, and Russia's Central Bank hiked its key rate by 6.5 percentage points last week. For all of 2014, the ruble has declined by 70% against the dollar. 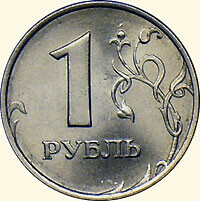 At the start of the year, each dollar bought 32.9 rubles. Now, each dollar will buy you 54 rubles. The country's former finance minister, Alexei Kudrin, told the BBC that Russia is in the midst of an economic crisis. By raising the price of its devices on its Russian online store, Apple faces the prospect of pricing itself out of the market. On Monday, not only did Apple raise the price of the 16GB iPhone by 35%, it also had to deal with an 8% rise in the ruble against the dollar. After Monday's currency fluctuations, this version of the iPhone 6 now costs the equivalent of $982 USD on Apple's online store in Russia. Rubles falls off 50% in one year and you expect companies to sell products with same price? You must be either an idiot, troll or clueless. Choose one, anyone fits you. Why don't Apple price its products in Russia by US Dollar? Or this is not permitted by the Russian government? Not only russia but throughout the world. Even in India it costs $850-$880. Anyways good news for Russian iSheeps who would buy this. Cause it wouldn't make sense when 90% of your customers have rubles. The country legal system will not let's you do that, you could be fine .......so yes your thinking is right. I know they won't stay away for long, they'll just keep increasing the price and see it at probably higher profit margin. Why should anyone care about Apple's products in Russia? Especially considering that all products sharply increased in prices there, not only Apple's and not only mobile devices.